You can either spray weeds with an herbicide or pull them if you are into organic lawn and garden practices. By pulling weeds before they can produce seeds, their presence will be minimized over the course of the season. One of the healthiest things you can do for a spring lawn is to aerate. The process of aeration involves either removing small cores of soil from the ground (called core aeration) or by puncturing the soil with small spikes (spike aeration). This process is helpful in reducing thatch buildup which can harm your lawn. Another good way to remove thatch is to rake in the spring. Despite there being very few leaves, raking will pull away excessive harmful thatch. Aeration also makes it easier for crucial nutrients and water reach your soil. A lawn can be fertilized organically or chemically. Regardless of your choice, fertilizer is imperative to help lawn growth. Be careful though, too much can promote disease and weed buildup. Spring is the perfect time to assess your lawn’s health and take steps to improve weak areas. 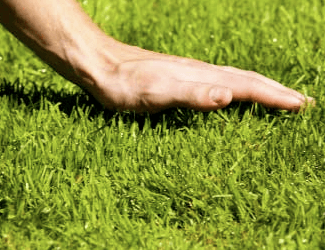 If you have patches of lawn that have been damaged by human feet, dog waste, snow, etc, reseeding the lawn can help fill in these trouble spots. Ideally, you should try to seed problem patches in the fall, but in a bad situation, seeding in the spring can be fine. After all, you don’t want to go all summer with unsightly dead patches, so remedy the situation now.